Of all of the methods of adding people to your Pocket PC address book, you’ll probably spend the most time adding records manually, which isn’t the easiest way to add records, nor is it the quickest. But adding records manually is the one way that’s always available, and the one that gives you the most flexibility. You may find that your Pocket PC manufacturer has added its own enhanced version of the address book to your unit. While this enhanced version probably has a bunch of neat features that aren’t in the standard version, you may get confused if you try to use the fancy version in place of the plain old vanilla version discussed here — at least while you’re following along so that you can see how this all works. You can always switch over to the fancy-pants version later because they both share the same data file. 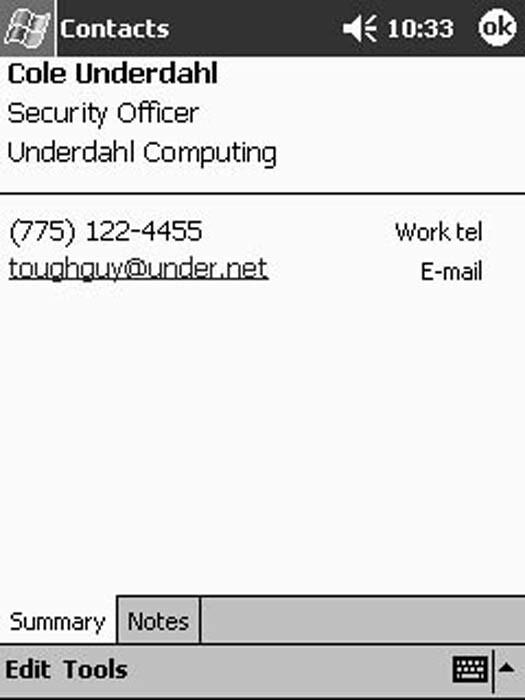 You need to begin by opening the Contacts application, which is what the Pocket PC address book is called. You can open Contacts by pressing the appropriate button on the front of your Pocket PC — if you remember which button does this on your unit and you haven’t changed the button assignments, that is. You can also open Contacts by clicking the Start button and tapping Contacts on the Start menu. Now you’re ready to add a new record to the list. Begin by tapping New in the lower-left corner of the Pocket PC’s screen, which opens a new blank record so that you can add information. Figure 1 shows how a record looks after you’ve added information in several of the fields. 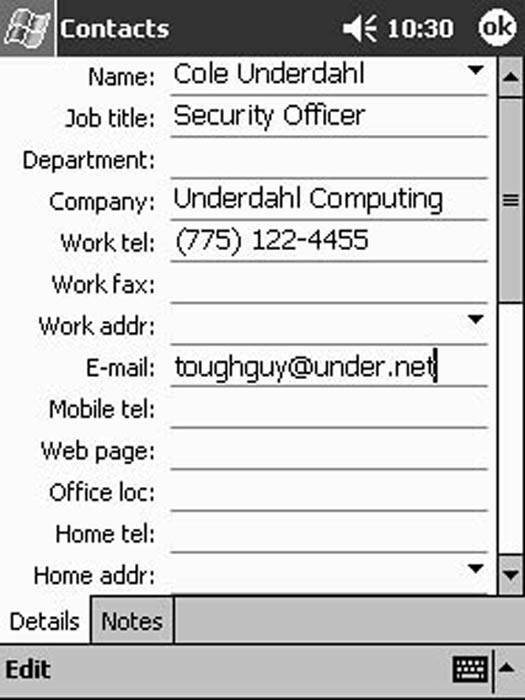 Figure 1: Enter contact information into any of the fields as necessary. Although the entry form shown in Figure 1 has so many different fields that you’d need several screens to view all of them, you don’t have to use any of the fields that you don’t need. In fact, when you later have a look at one of the records in your address book, you find that your Pocket PC is smart enough to show a field only if it actually contains information. In most cases, this means that anyone’s record can easily read on a single screen. When you’re done adding information, tap OK to close the new record and add it to the address book. To confirm that the record was added correctly, you can find and view the record. Depending on just how many people you’ve added to your address book, finding a record can be a bit of a pain unless you understand a few of the tools that are available to help you out. There are two ways to narrow your search so that you don’t have to scroll through quite so many records in your Pocket PC address book — using categories or the alphabet bar. Figure 2 shows both of them. Figure 2: Use categories to make finding specific records easier. If you selected a category when you entered someone’s record, you can narrow your search by clicking on the category list (just below the Start button). This drops down the list so that you can choose a category to view. When you select a category, only those records that are in that category appear in your Contact list. 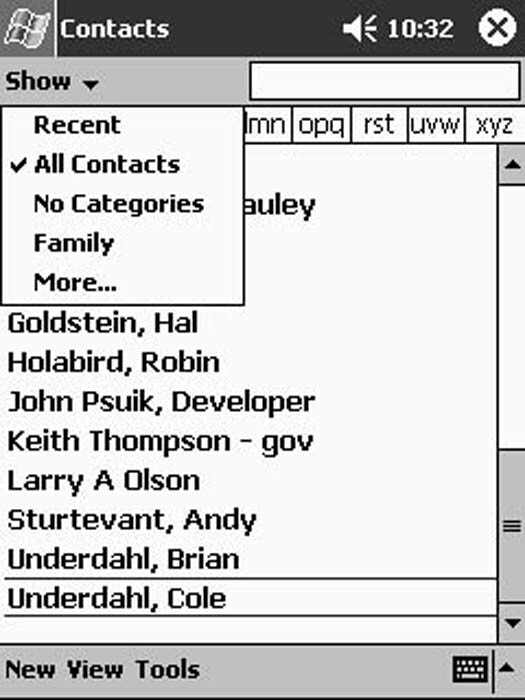 Remember to select All Contacts to make the full list available again. In addition to selecting a category, you can also click on the alphabet bar (just above the list of records) to jump to a spot somewhere in the middle of your address records, which beats using the scrollbar to move the entire distance. When you’ve found the record you want, click the record to view it. As Figure 3 shows, the information is condensed so that you see only those fields with information filled in. Figure 3: Open the record to verify that the information you added is really there. To quickly modify the record you’re viewing, tap Edit on the menu bar. This opens the record and shows all the fields — even the ones that don’t have any information yet.